Essex County, Massachusetts was among the most densely inhabited areas within the American Colonies and, as a result, numerous private schools and academies for young women flourished there. 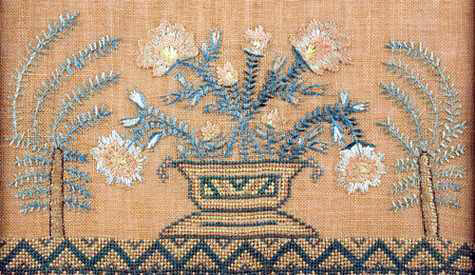 According to Betty Ring in Girlhood Embroidery, Salem alone had four public Schools and three Houses, four private Schools, Women's schools for needle work, four well known in addition to the great number for reading only, or "common work." Eliza was the daughter of Richard Woodbury, Jr. (1798-1842) and Eliza Foster who were married on October 4, 1825 in Beverly, Massachusetts. 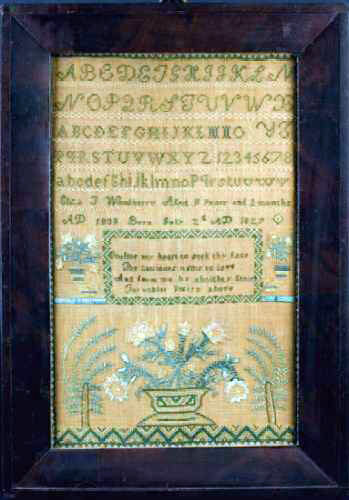 Besides Eliza who was born on July 2, 1827 as she states on her sampler, there was also a son born to them on March 3. 1834 named Richard Augustus Woodbury. Unfortunately, not much else can be known of her life as she died on July 10, 1843 of consumption when she was just sixteen years of age. The colors on the sampler are very pleasing . . . Several shades of green were used, from olive, to teal, to seafoam green while pale gold, ivory, and apricot colored flowers fill the Urn and Cornucopias to overflowing. Worked in silk on linen, the sampler is in excellent condition and conservation mounted into a beveled mahogany frame that appears to be original to the piece and protected with Tru Vue glass to preserve it for future generations. 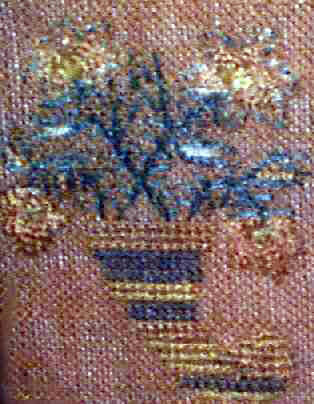 Size is 11" wide and 17 1/2" high.